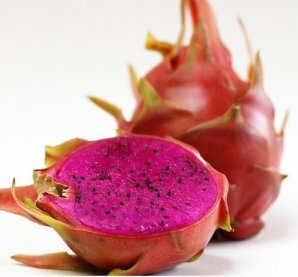 Dragon Fruit is a vining, terrestrial or epiphytic cactus, with fleshy stems reaching from a few inches up to 20ft long (in mature plants). The plant may grow out of, and over the ground or climb onto trees using aerial roots. Flowers are ornate and beautiful, and many related species are propagated as ornamentals. They bloom only at night, and usually last just one night where pollination is necessary to set fruit. 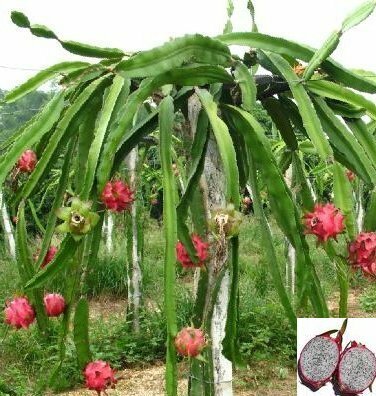 In full production, pitahaya plants can have up to 4-6 fruiting cycles per year. Hardiness: Will tolerate temperatures to 104F, and short periods of frost, but prolonged cold will damage or kill the plant. 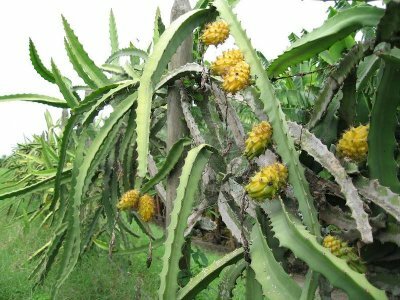 Growing Environment: Dragon Fruit grows best in dry, tropical or subtropical climates where annual rainfall ranges from 20-50" per year. In wet, tropical zones, plants may grow well but sometimes have problems setting fruit reliably. The plants aren't usually too fussy as to soil type, but because of their epiphytic nature, it is recommended to grow them in soil that is supplemented with high amounts of organic material. The plant has been grown successfully in sandy soils. The fruit is popular eaten chilled. Sow the seeds in a gritty potting mix, water and cover the container or wrap in a polythene bag. A few weeks later the seedlings should start to appear. This is a reminder that all cacti are true dicotyledons as the seedlings come up with two seed leaves, a bit like germinating beans. At this stage there is no evidence that they will develop into cacti, but these are the first and last leaves that will be produced. As the seedlings develop, an angular spiny stem grows in the central growing point between the two leaves. The stem thickens and elongates and after several months the cotyledons shrivel and are shed. The seedlings can be potted on into individual pots and in principle could be grown on to a large plant and flowered to produce more fruit.